It is important to be sure that your self-perception doesn't become a self-fulfilling prophecy, that because you think you can never be a leader, you never will be one. This is a problem for many people because we are so strongly inclined to idealize or look up to leaders as if they were on a lofty plane out of reach of the rest of us ordinary mortals. 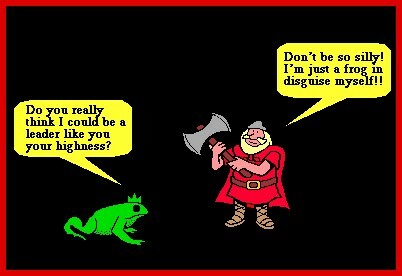 This is the old fable about turning a frog into a prince. But the point here is that you don't need to be to be super-special to show leadership. No position is necessary, so even a lowly frog can show leadership. This "prince" is at least honest in admitting that, despite appearances, he is really no better than the frog. Looking up to people as role models is fine as long as it doesn't create an unhealthy degree of dependency or worship thus being disempowering and disengaging. Because we look up to people to an unhealthy extent, we disempower ourselves, thinking that they are so far above us why bother even aspiring to reach anywhere near their level. This is self-defeating before you even try. We disempower ourselves with our hero-worship attitude that elevates those in charge of us to such a lofty level that we feel we could never achieve their heights. The key is to show small scale, local leadership which you can do simply by setting an example for your colleagues or by advocating a better way of doing things. Anyone can show leadership every day in this sense.